For rehab, athletes, sprinters, wheelchair exercise. Standard Features: Front & side rails, emergency stop button & non-programmable controller. Speed: 1 to 30 mph (48 km/h). Running surface: 48" x 84" (122 cm x 213 cm). Floor to running surface: 11 inches (28 cm). 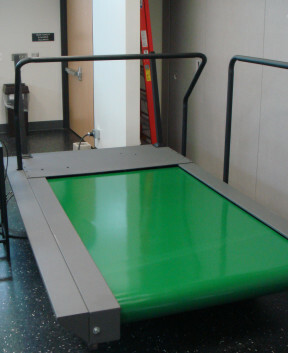 Negative elevation option increases height from floor by up to 10 inches. Requires 6-foot wide access during installation. Crated dimension approx. 7' wide x 5' foot high x 11' foot long.